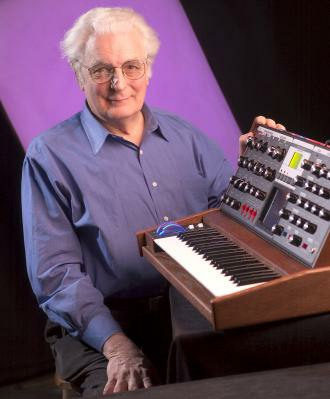 Google honors again a pioneer of electronic music: Robert Moog was born on May 23, 1934 (78th birthday). He invented the Moog synthesizer. For Moog it was a machine, but for musicians it’s an instrument. „Bob Moog’s innovative electronic design is employed in numerous synthesizers including the Minimoog Model D, Minimoog Voyager, Little Phatty, Moog Taurus Bass Pedals, Moog Minitaur, the Animoog iOS app, and the Moogerfooger line of effects pedals.“ Source. Here the static version of the doodle as you see it if you use an old-fashioned browser like internetExplorer. Google wouldn’t be Google if they didn’t use the chance to promote his own Chrome. The Moog’s biggest break came in 1969, when musician Walter (now Wendy) Carlos had a huge, Grammy-winning hit with “Switched-on Bach,” popularizing electronic music with Moog-made renditions of Johann Sebastian Bach. Canadian pianist and Bach interpreter Glenn Gould said that Carlos’ Fourth Brandenburg Concerto was “the finest performance of any of the Brandenburgs — live, canned or intuited – that I’ve ever heard.” Read the whole interview! The official GoogleBlog postet an article about thi samazing doodle: A tribute to Bob Moog, sonic doodler. 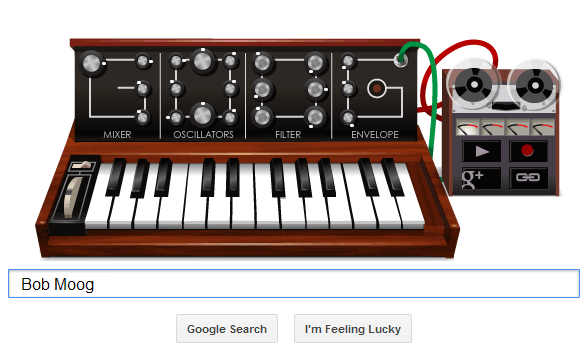 1 Comment zu "Google honors Bob Moog with amazing synthesizer Doodle"